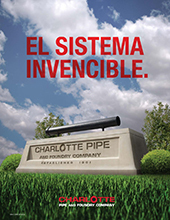 Charlotte Pipe has been in business since 1901, and the quality of our plumbing products has a lot to do with that. We manufacture the industry’s broadest range of standard and specialty DWV products. Plus, we are the only company that makes cast iron and plastic pipe and fittings. All products manufactured by Charlotte Pipe are proudly made in the USA and meet all applicable ASTM and NSF standards. Along with ASTM standards and NSF listings, Charlotte Pipe products have received the following – CISPI, ISO 9001: 2015, ICC-ES PMG Listing 1082, ICC-ES PMG Listing 1083 and more. For more information our international sales team can be reached via the information below or team at (011) +1 (704) 348-6450. Chongqing Berkeley Trading Co. Inc. Mechanical & Chemical Supplies Co., Ltd.
Fallah Al Mustaqbil Trading Est.